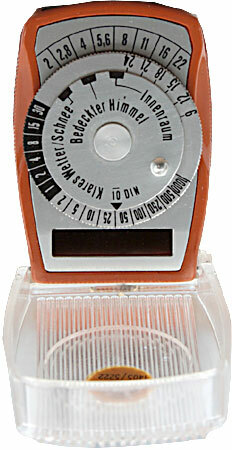 At a glance it looks a lot like a Horvex 2 or any of the German meters of the 50s. But really it's just a delux version of my Expophot. There's a slit on the front edge (at the bottom of the meter as it's oriented in the photo here), a mirror, and the light illuminates a graduated series of f/stops which appear in that black window at the bottom. You match the f/stop at the top of the dial with the lighting conditions, and then read the speed at the bottom of the dial the arrow points to. It's only calibrated for 10° DIN, but you can make allowances if you're so inclined. The only thing that really sets this meter apart from anything is the hinged plastic cover, which is a nice touch. That cover is likely the reason this meter is still in such nice shape after all these years. I have it marked here as being East German but really that's just a guess. I was fortunate enough to get the box, which is entirely in German, and I bought it from a man in Bulgaria. It's possible it's West German, but it seems reasonable to think otherwise. If anyone knows for sure, please email me and let me know.